I probably used way more pink than I intended to. Tis the season for egg-dying and I must say: it's one of my favorite springtime activities. Since we've now designated them as "holiday eggs" instead of Easter Eggs, everyone can enjoy them! The cool thing about decorating eggs is that you can go crazy with things. 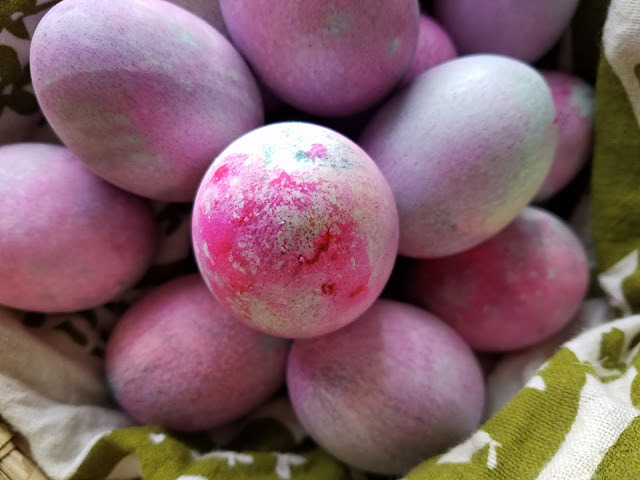 Thanks to Pinterest and curious crafters all over the world, there are about a million different ways you can do the egg dying thing! I have a pinterest board that's just full of holiday ideas (four or five of which out of the near 100 pins I've actually tried out) that proves just this. And, hey, those are only the ones I've found. One of the things that I've noticed about the few pins on egg dying that I've tried is that they take too long. I am, admittedly, one of the most-impatient people on the face of this planet; that being said, I wanted to try a technique that was fast-ish, and let me do other stuff while it sat all in one place. Enter the ice dyeing. Ice dyeing is a really neat technique that you use on clothing to get neat tie-dye effects. The cool thing about ice dyeing is that you don't need to mix a bajillion different buckets worth of dye in all of your different colors; you just dump a bunch of ice all over your fabric, sprinkle the dye where you want it in whichever patterns you want it, and then go do something else. Another cool thing about dyeing with ice is that (I hear) it yields brighter colors. The design aspects get a little better with that as well, as you don't have to worry about something bleeding over. You should definitely try ice dyeing the next time you feel like giving life back into an old pair of sneakers or a tee shirt or white dress that's too stained to do anything with so you just dye it instead. Since I didn't have any powdered food dyes (or, rather, I only had green) I used liquid food dye. After boiling my eggs for precisely 11 minutes, I evacuated them and set them in a strainer over a pot. 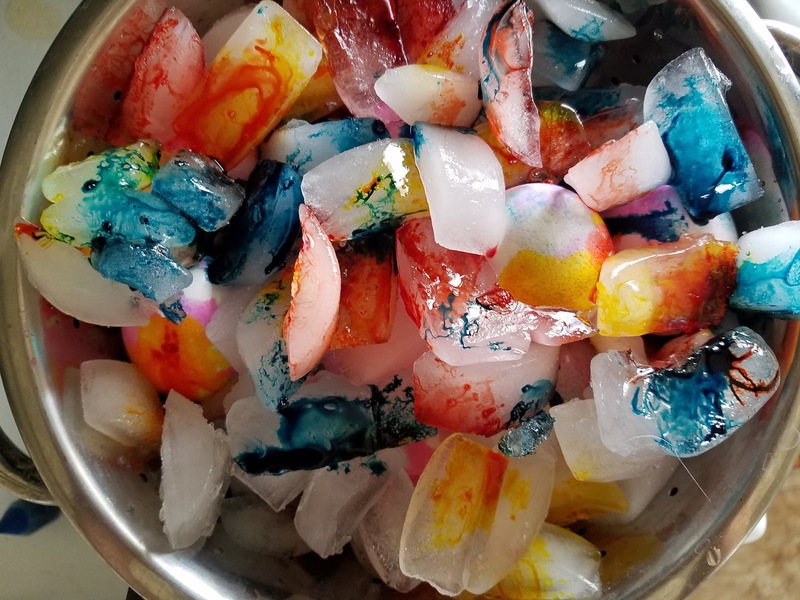 Once my eggs were drained, I layered them between ice and dye. All I did was put down a single layer of eggs in the strainer, cover with ice, and drop in dye here and there. I repeated until all of my eggs were covered with ice and dye, and then I went off to clean the kitchen. Since the eggs were hot, the dyeing process took a mere 10 minutes. Granted, I had a lot of ice - but the point is that it was relatively fast and it was fun to see a transformation happen right before your eyes. If you boil your eggs with a pinch or two of baking soda, and then shock them with ice, your eggs will peel MUCH easier than they would have otherwise. And if you feel like making it into an egg salad, press the peeled eggs through a cooling rack for a quick-and-easy chop. Hope you all enjoyed. Happy dyeing and happy eating!